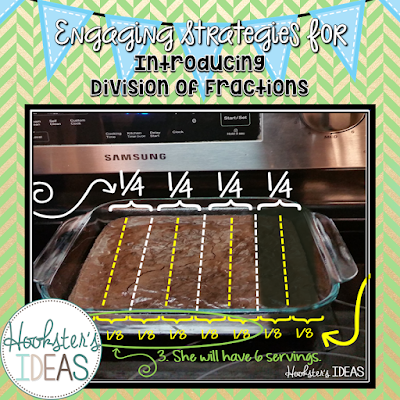 Many teachers start off by introducing the algorithm for how to add fractions with unlike denominators. This to me is the worst thing you can do! There are so many steps and if you forget one, you are screwed and it really doesn't help your students understand why they are doing that. What I like to do is involve food. I mean who doesn't love having food in class and I find it to be a stress-free way to introduce a tough concept. Round foods are great...pizza, pie, cake...you get the idea. Candy bars and brownies are always a hit too. I like to start off by introducing a word problem, but don't use those words. Students suddenly have an anxiety attack when they hear those two words, even though they help students understand difficult topics! I try to use students' names and teacher names as much as possible so it feels like a real problem. Milo and his best-friend Joseph are having some friends over for pizza after football practice today. Milo likes pepperoni pizza and Joseph likes cheese pizza. They have no idea what kind of pizza their friends want, so they decide to order a variety of pizzas. They order 1/2 pepperoni, 1/3 cheese, and 1/4 supreme. How many pizzas do they need to order? Do they need to come up with another topping? If so, how much of that topping do they need so that they are ordering only whole pizzas? I would assign groups of three to tackle this problem. Give them construction paper or newsprint to work out their solution to these questions. Using colored paper helps keep the different topping separate. Monitor the room and ask probing questions along the way. I give them scissors and paper to construct their understanding and poster and responses. Below are some photos of one way of doing it. Using some kind of bowl will help students draw a round circle. The 1/4 supreme does not fit. Half of it will fit, so fold and cut that piece in half. Add it to a second pizza. To figure out what size that half of 1/4 supreme piece is, trace it, move it, and repeat. Then count the number of pieces. Sample display of student work and answers to the questions above. 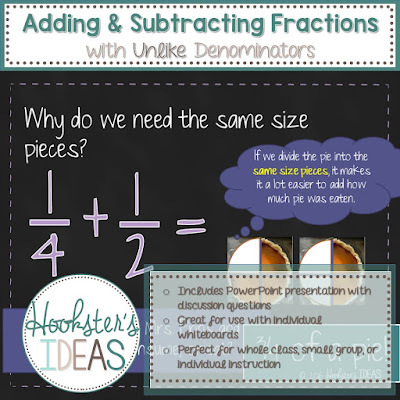 How do you introduce adding and subtracting fractions with unlike denominators? Comment below! If you like this approach, but don't want to actually bring in food, I have a PowerPoint I created and have used with great success too! You can find it here. 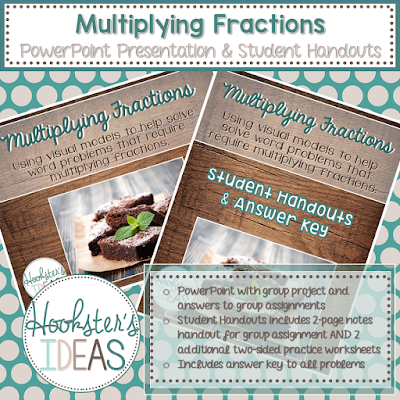 Need ideas for teaching multiplication and division of fractions? Click the photos below.